When you are shopping for a pair of diamond earrings, you can opt from different styles including studs, drops, danglers and hoops. Dangling diamond earrings are a unique piece of jewelry that markedly enhances the personality of the wearer. These dangling earrings generally come in varying lengths – ranging from one inch to several inches gently brushing the shoulders. 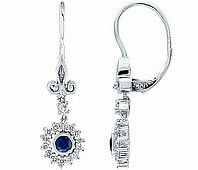 The two most widely favored diamond dangling earrings are the chandelier and drop earring styles. The chandelier types have a tantalizing appeal as they have many offshoots that spread out wide, while the drop earrings look more elite and sophisticated with a single line dropping down carrying the sparkling diamonds. Depending upon how the gold or platinum is laid and how the diamonds are displayed, these dangling diamond earrings can be bold and eye-catching or sleek and sophisticated. You must however be somewhat cautious when selecting the diamond earrings as the quality of the diamonds play a big part in the overall quality of the diamond earring. The diamonds should have clarity, color and the original sparkle of a quality diamond. Novori Jewelry prides itself in the level of quality used in all of its diamond earrings. Just compare the color and clarity of our diamonds. Of all the pieces of jewelry a woman wears, earrings or worn close to the face and reflect the beauty and even more so if the earrings are studded with diamonds. 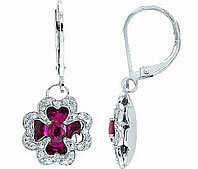 In fact, in today’s market, diamond dangling earrings are available in some of the most exciting designs. Some are simple and yet elegant while others are rich and bold and there are still others that looks sophisticated and costly and worn by the privilege few. When you wish to offer a gift to someone special and cost is not a factor, then a pair of dangling diamond earrings is the ideal choice. A wide selection of dazzling diamond earrings are available and include the full variety of styles suitable for every occasion and every individual taste. It may be worthwhile to consult our diamond jewelry specialists at Novori Jewelry before buying diamond earrings as they will be able to guide you properly. For instance, an ornamental pair of dangling diamond earrings may not be the right choice for all occasions, but may be the deal for a rare occasion like attending a wedding. Apart from danglers, there are also exquisite earrings – in circular, semicircular and oval shapes - known as hoop earrings. Diamond hoop earrings usually carry a row of diamonds in the front specially intended to make heads turn. Loose or broad hoop diamond earrings swing enchantingly below the earlobes that makes the wearer look more conspicuous and stand out in any crowd. Classy looking small-sized diamond hoops are particularly popular amongst middle-aged women as they show as a sign of beauty. The over-sized hoop earrings appear more playful and are sported by younger women. 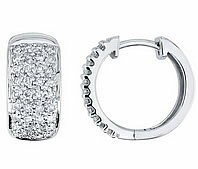 Drops are earrings that dangle below the stud setting and they come in many different lengths. 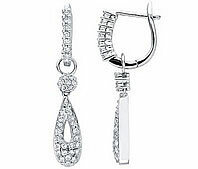 When you choose a set of diamond drop earrings, the diamond should be seen dangling at the end as also in the studs. You can choose stud diamond earrings if you sport long hair. When buying dangling diamond earrings, make sure they are of quality materials and workmanship as this is important both for wearing the piece of jewelry on the ears and also for balancing the weight effectively so that they hang evenly. Diamond jewelry is an investment when the right, quality jewelry pieces are purchased. 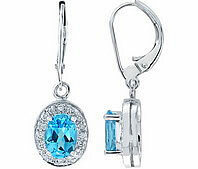 Feel free to contact Novori Jewelry for your diamond earring questions. You can reach us toll free at 1-87-877-4141.